No refund for No Show or Reduction In Numbers after two weeks prior to arrival date. All monies to be paid two weeks prior to arrival date.With groups over twenty the bus driver will be kept free of charge. 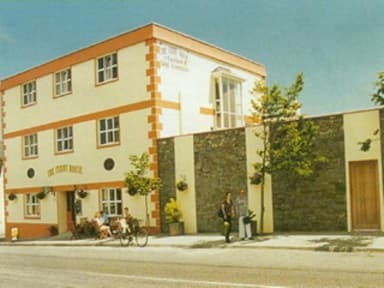 The Ferry House Hostel is located in the heart of the village of Tarbert, one mile from the Tarbert/Killimer car ferry which links Killarney and Dingle in Kerry to Doolin and Cliffs Of Moher in Clare. The three storey stone building with wooden floors and open fires was built in the 18th century and worked as a hotel then, it was totally re-furbished in 1996. Within two years it was voted Best Hostel In Ireland by 'Lets Go' American travel guide. Das Hostel war gut. Ein schönes Haus und auch passabel für den Preis. Leider lag viel Gerümpel im Hof und unter der Treppe rum. Bei uns war das Wetter schlecht aber man hätte in dem eigentlich netten Innenhof auch nicht verweilen wollen. Positiv war die kurzfristige Änderung der Reservierung ohne Probleme (Stornierung einer Nacht). Das Hostel ist gemütlich mit alten Sesseln und Sofas (manche allerdings schon seeeeeeeehr durchgesessen) eingerichtet. Die Küche ist eine Zumutung, ultra ranzig, wir haben das Geschirr gespült, bevor wir es benutzt haben. Mehr als eine Tiefkühlpizza will man da nicht zubereiten und im Mülleimer wächst ein Haustier. Die Cornflakes, die das Frühstück darstellen, stehen einfach den ganzen Tag im Aufenthaltsraum. Kaffee und Tee haben wir nicht gefunden. Die Zimmer waren ok, das Bad sehr sauber. Sauberkeit in Küche eine Zumutung. Viele Räume und der Hof vermüllt. Auch Abzug durch das fehlende w-lan im obersten Stock. Therefore was dirt in a bed. The host doesn't care for the Hostel especially the yard which was still messy as another guest already stated. Sorry, nur I was happy when I left the spot. The host didn't even know I was coming although I had prebooked.